In their joint position paper and another publication, more than 20 expert scientists from 14 research institutions for the first time summarize the current state of research. They confirm key statements for the Alpine region and the low mountain ranges in Germany, point out knowledge deficits, and recommend actions. "Discussion on climate change and its impacts needs an objective, understandable presentation of facts. We have succeeded in formulating a joint position and clear statements together with other researchers from Germany, Austria, and Switzerland," says Professor Karl-Friedrich Ziegahn, Head of Division IV – Natural and Built Environment of KIT. At the Atmospheric Environmental Research Division of the Institute of Meteorology and Climate Research of KIT (IMK-IFU), KIT's Campus Alpine, scientists of KIT study potential impacts of climate change on mountain regions among others. 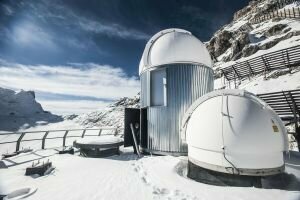 "For Alpine regions in particular, we assume a very rapid and extensive climate change. Both observation time series of the past and our climate computations for the future reveal a higher temperature increase. The existing climate and vegetation zones will move to higher altitudes and also snow conditions will change," says the Head of IMK-IFU, Professor Hans Peter Schmid.